Happy Halloween to all the ghouls and goblins out there! The past few weeks have been pretty crazy here so today I’m packing everything in to one giant sized, spook filled post. 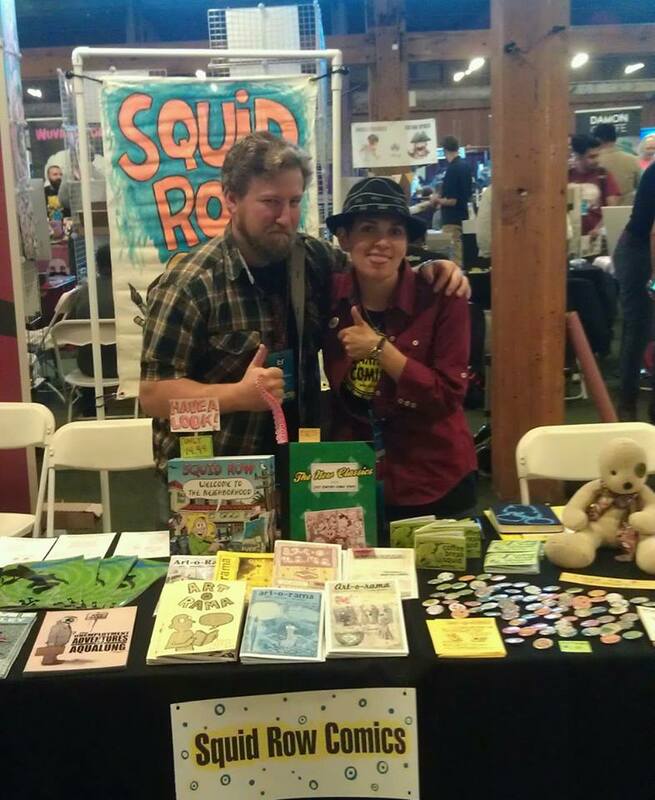 During the weekend of October 12th and 13th my cartoonist pal Bridgett Spicer and I descended upon the city of San Francisco to thrill and chill unsuspecting attendees at the annual Alternative Press Expo. 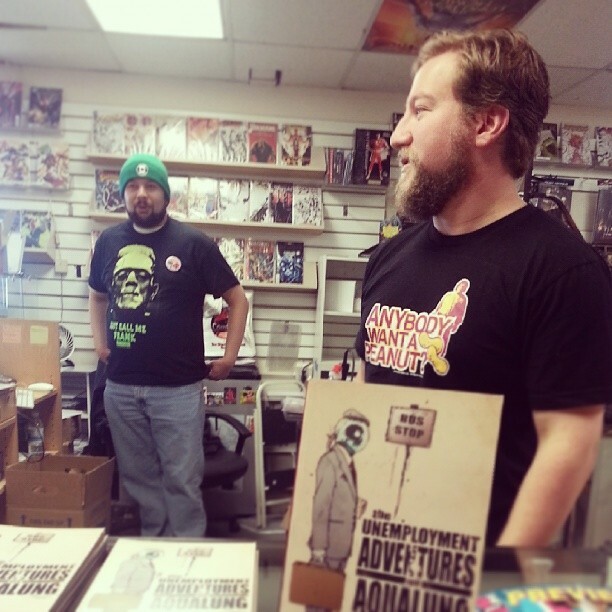 The turnout and sales were not as spectacular as I was hoping but we had a great time and APE is still one of my favorite shows though the overall interest of convention goers there seems to have turned more towards the craft side of creation as opposed to comics. 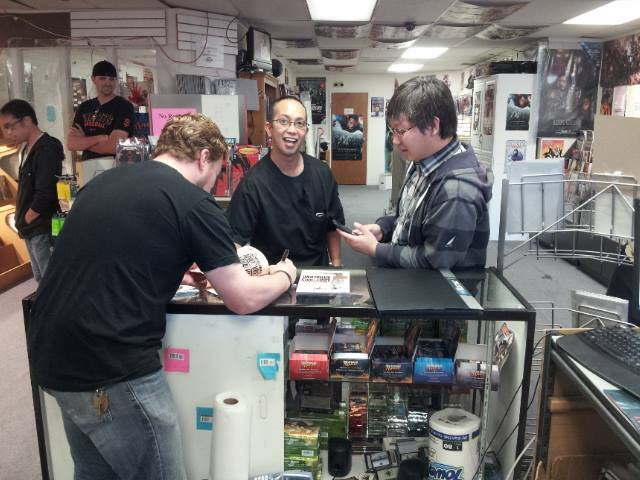 We still managed to scare up a few sales and met a bunch of terrifyingly awesome creators! A really great drawing of yours truly by the uber talented Ruben Gerard. Click the pic to visit his great website! Following APE I was approached by my good friend, and fellow beer enthusiast, James DeLeon to design a logo for his new wing restaurant here in town. I was more than happy to oblige and allowed the establishments name (and possibly some good ole’ Ralph Bakshi) to serve as all the inspiration I would need to allow the logo to rise and strike hunger into the hearts of all who laid eyes upon it. If you’re ever in Salinas, CA and looking for some food so frighteningly full of flavor and spice you’ll tremble visit Fatcat’s Wing Joint at 129 Main St. in Old Town! You’re not scared of a little heat, are you? That’s about all for now my visiting trick-or-treaters. Thanks for stopping by and beware tonight kiddies for it is All Hallows Eve when the things that go bump in the night are just around every corner and the dead roam the Earth. So go out there if you dare and have fun but be sure to make it home safe… Preferably before the witching hour! The Alternative Press Expo (APE) returns to the Concourse Exhibition Center in San Francisco this weekend October 12th and 13th to celebrate its 20th annual event. One of the leading alternative and self-published comics events in the country, APE was started in 1994 by Dan Vado, the head of SLG Publishing. I have been many times to this wonderful convention and for the past couple years have even conducted workshops on collaborating and networking. This year I will be exhibiting with the awesome Bridgett Spicer! 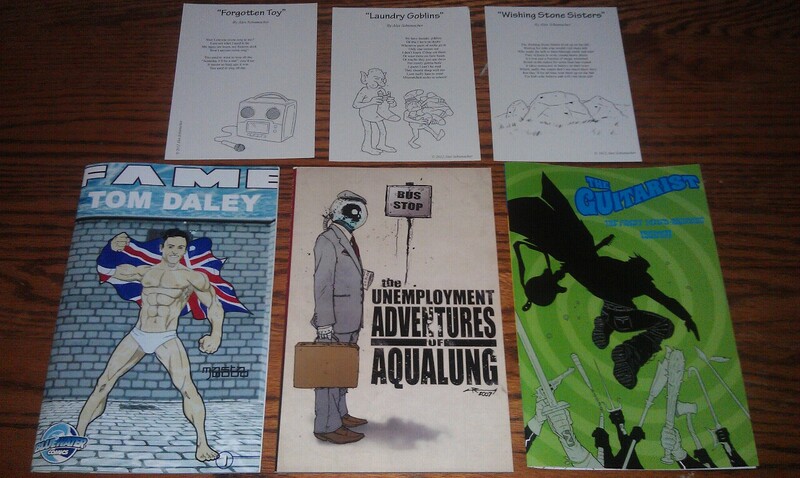 I will be selling copies of the “Unemployment Adventures of Aqualung”* which I co-wrote and drew for Arcana Studios, “Fame: Tom Daley” which I drew for Bluewater Productions, a sixteen page teaser for CW Cooke’s and my upcoming series “The Guitarist” and some of my illustrated children’s poetry cards (all pictured below). Come on by and see Bridgett and me at table 832B from 11-7 on Saturday and 11-5 on Sunday! See you at APE! For more information visit http://www.comic-con.org/ape. *Due to unforeseen shipping delays I may only have a few copies of “Unemployment Adventures of Aqualung” but am currently working to remedy the situation.